The other day I was going through this site and I realised I have over 500 of my favourite recipes on here now, I could not believe it, 500, that is a lot of recipes tried and tested. What is scary is I have so many more that I need to post, if only to find the time to post them all. 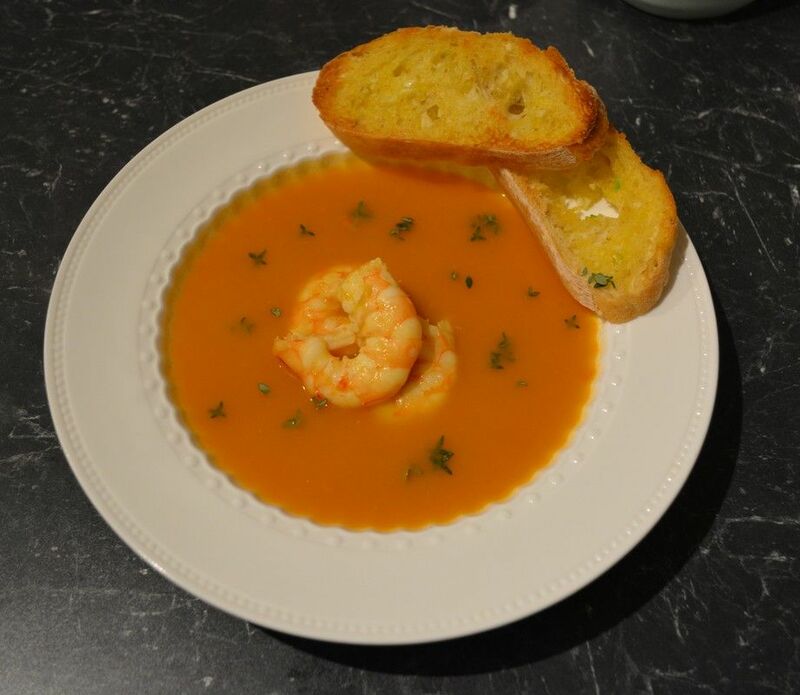 But I will do it one by one, and I'll start with this Prawn Bisque. This is fabulous and I have been wanting to post it for ages but I was never happy with the photo I took of the soup, until now. This soup is so delicious, it is delicate, it is full of flavour, it is just so good. It is easy to make, which I love, so easy my 10 year old made it the other day. The flavour from this soup comes from prawn shells, I love that. I love that I no longer have to discard prawn shells without cooking them first. 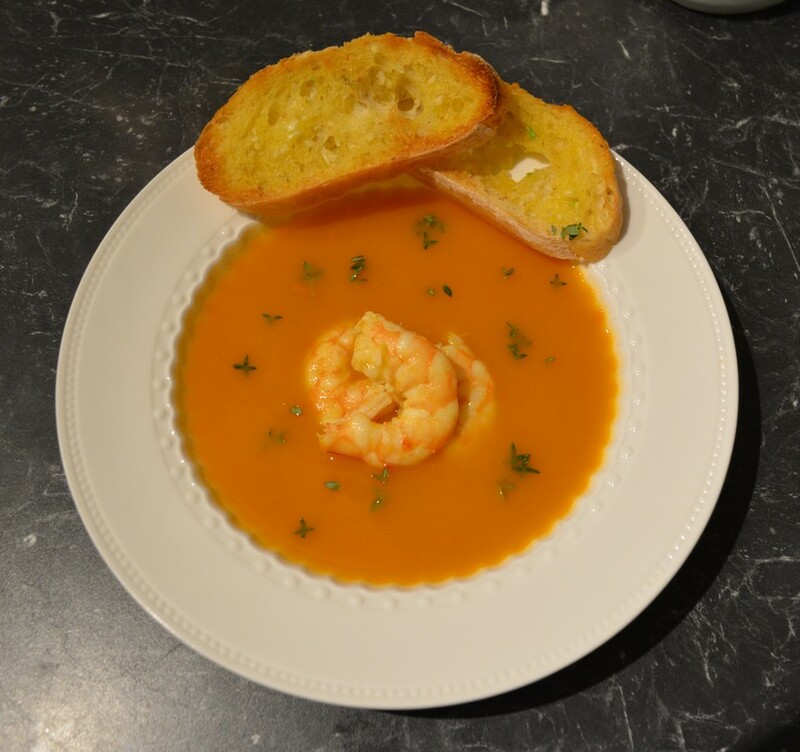 I even freeze them now if I can't make the soup straight away and I only needed the prawn meat for another recipe, and then I just defrost them and I usually have frozen peeled prawns in my freezer and I defrost 12 so I can add them to the soup. The original recipe I have had for a very long time and I can't remember what magazine or cookbook I got it from, so I can't tell you, sorry, I normally like to disclose where I get my recipes. I added Cayenne Pepper to the recipe as prawns can be sweet, so I thought it needed a bit of spice to counter the sweet prawn flavour. If you don't like spice, just don't add it, it still is beautiful. The croutons or garlic bread is essential, it compliments the soup perfectly. Try and use crusty Italian bread, as it adds crunch and I think is perfect for this. So next time you are peeling prawns, don't throw out the peels, make this, you will love it. Heat the oil in a large saucepan over medium heat. Add the reserved prawn heads and shells, and cook stirring, for 4-5 minutes or until the shells are browned (the shells will pop and crackle loudly). Add the onion, carrot, celery, garlic and bay leaf, and cook, stirring often, for 5 minutes or until the onion soft. Discard the prawn heads. Add the water, wine, cayenne pepper, rice, tomato paste and saffron to the pan, and bring to the boil over medium-high heat. Reduce heat to medium-low and simmer, uncovered, for 15 minutes or until the rice and vegetables are tender. Set aside to cool for 10 minutes. Transfer mixture to a blender (shells included) and blend until very smooth. Strain through a coarse sieve into a clean saucepan. Stir in extra water. Taste and season with salt and pepper. To make the garlic bread, preheat grill on medium-high. Combine the butter, garlic, salt and pepper in a small bowl. Spread the mixture thinly over the baguette slices. Place slices on a baking tray and cook under preheated grill for 2-3 minutes or until golden. Meanwhile, bring bisque to a simmer over medium heat and add prawns. Cook uncovered, for 1-2 minute or until prawns are just cooked, remember they continue cooking even when you turn off the heat. Ladle into serving bowls, sprinkle with thyme leaves and serve immediately accompanied by the garlic baguette.